This is a very bright seventh floor apartment located within a centrally-located and well-maintained block. 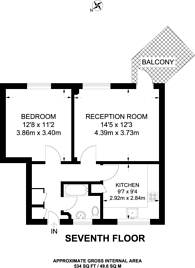 Boasting a spacious reception room, double bedroom and modern kitchen plus a private balcony. Parmoor Court is located close to the amenities in CLerkenwell, Old Street and Shoreditch with the nearest stations being Barbican and Farringdon (future Crossrail site). 534 (49 Sq M) approx.